The Jakarta Fashion Week (JFW) is the big event of Indonesian fashion in which presented the many kind of design of clothing and dresses by the famous Indonesian designers. 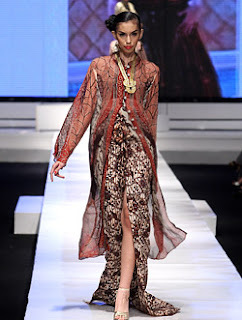 In JFW 2010/2011 there will be more than sixty of Indonesia’s leading designers will partake in the event. Many of them will present collections inspired by the country’s rich heritage in different types of traditional fabrics while simultaneously keep their eyes on the present and future. All the shows are invites-only, targeted to celebrities, socialities, buyers, local and foreign media and all who love fashion. This Jakarta Fashion Week is held annually and aimed to provide directions to the Indonesian fashion industry as well as a vehicle to demonstrate its wealth in talents and creativity. Ultimately, the goal is to turn Jakarta as a major fashion hub in the region and the world. The third Jakarta Fashion Week will be held November 14th-20th at the Pacific Place shopping mall in South Jakarta in a collaboration between the Municipal Government of Jakarta, major stakeholders of the fashion industry as well as the media.The Jakarta Fashion Week 2010/2011 theme is Styling Modernity. The JFW is organized by event management company Azura Activation, part of the publishing company Femina Group, which since its founding in 1971 has been active in promoting the Indonesian fashion industry through various editorial initiatives as well as events.